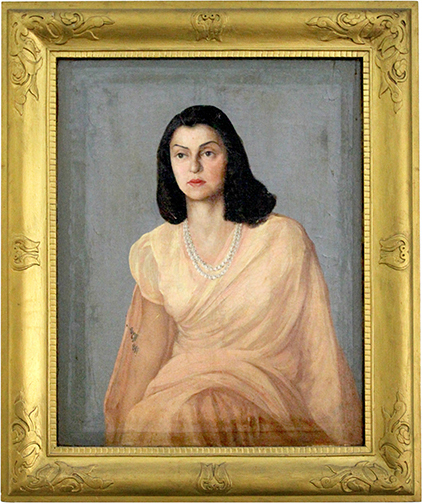 First portrait of then Maharani Gayatri Devi in the school. Founded in 1943 by Her Highness Maharani Gayatri Devi, this school was named after her. Based on the basic guidelines of the British Public Schools ideology MGD School is a happy blend of the British system and Indian Traditions. It was primarily founded to get the girls of Rajasthan out of the shackles of the claustrophobic purdah system and give them the wings to grow and soar into the changing world of the 20th century. Under the dynamic leadership of its founding Principal, Miss L.G. Lutter MGD saw phenomenal growth. Introduction to a multitude of extra curriculum activities and the success in following the Cambridge School Certificate led the Indian Public-School Council to recognize it as a member giving it the distinction of becoming the first Indian Public School for girls. Beginning with 24 girls it currently has 3,200 on its rolls and follows the Central Board of secondary Education curriculum with a battery of modern day technology and elective subjects. • Late Miss. L.G. Lutter (1943-1980) (Founder Principal, at the helm for an awesome 37 years spell). • Late Miss. S. Doonga Ji (July 1981- December 1988). • Late Dr. Mrs. G.D. Bakshi (January 1989- April 2009). • Mrs. Suniti Sharma (May,2009-April,2018). • Mrs. Archana S Mankotia took over in May, 2018. She is currently the Principal. The Silver Jubilee was celebrated in 1968. Dedication Day started with majestic sound of 25 `Shanks’ with unfurling of School Flag by Miss L.G. Lutter. The Golden Jubilee was celebrated in 1993. For the Prize Giving function, the Chief Guest was Shri K.R.Narayanan, Vice President of India. Governor of Rajasthan, Shri Chenna Reddy was the Guest of Honour. The School’ Diamond Jubilee was a sparkling event in 2003. Rajmata Sahiba was the Chief Guest for all the functions. Emerald Jubilee of MGD was celebrated in the year 2008 by the Guild. IMPORTANT DIGNITARIES WHO VISITED MGD. • Dr Shayama Chona nee Sethi, Batch 1958 (awarded Padma Shri in 1999 and Padma Bhushan in 2008). • Princess Bhuvaneswari Kumari of Kota, Batch 1962 (awarded Arjuna Award in 1968). • Meira Kumar, Batch 1962, Ex Lok Sabha Speaker. • Sandhya Mridul, (Film Actress). • Apurvi Singh Chandela, Batch 2010 (awarded Arjuna Award in 2016).